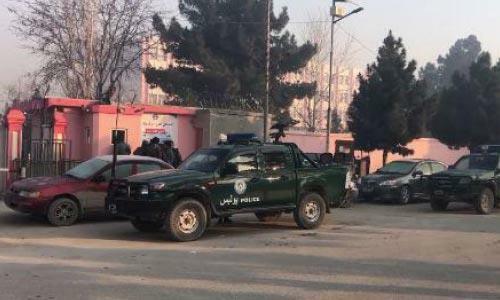 (MENAFN - Daily Outlook Afghanistan) MAZAR-E-SHARIF - Balkh police reportedly raided Afghan-Turk schools in Mazar-e-Sharif city on Thursday night, arresting almost 100 teachers, students and employees of the schools – including six Turkish citizens. Salih Bayir, Mustafa Alyar, Serat Gunes, Cengiz Caragoz, Cemal Kose and Ismail Kizmaz are the Turkish citizens who have been arrested by police, claimed an Afghan-Turk teacher. According to Afghan-Turk school teacher, Shukrullah Samadi, those arrested include 60 students, 15 teachers and 30 employees of the school. Samadi said at least 20 of those arrested have been released while others are still in security forces custody. Footages obtained by TOLOnews show that some rooms of the school have been searched by police during the raid. 'Police raided the (boys) school at around 2:30am and detained a number of teachers, said Samadi. 'At 3am, they (police force members) raided girls' high school. Students' parents at a gathering near the schools said the move was unlawful. Some students claimed that the security forces entered every part of the compound in search of students and teachers while broke the main gate as they were not allowed to enter the girls school at the first stage. 'Entering into girls' dormitory at night itself is illegal.. If they hold the order of court, then we will cooperate with them, but they don't, Zafar,parent of a student said. Balkh police, meanwhile, said they have executed the order of relevant officials. 'The move has been made based on an order. You know that the Afghan-Turk schools' educational certificates have lost credibility. It is a waste of time for students who join these schools, Balkh Police Chief Gen. Akram Saame said. This comes after two Turkish citizens and former teachers at Afghan-Turk schools, Yulmaz Aitin and Sami Yaoz, who were under house arrest in Kabul for at least 13 months, were released and were granted asylum in Sweden. Back in December 2017, Afghan security forces raided an Afghan-Turk female high school in Taimani area in Kabul's PD4 and surrounded the school for at least three hours. The teachers were arrested at that time. Afghan-Turk schools' parents associations said two teachers had filed an asylum application to the UN office in Kabul over fear of prosecution in Turkey. The Turkish government had asked the Afghan government to hand over these individuals to Turkey. But there is no extradition agreement between the two countries. At least 600 boys and girls are enrolled in Afghan-Turk schools in Mazar-e-Sharif city. The management of the schools are supposed to be handed over from Cag Educational Foundation to Turkish government, but the students and teachers of the schools are resisting against the decision.